under the State service of Uttar Pradesh. These posts come under the Grade I category o f UPPSC. These vacancies are gazette/temporary but there is a chance of regularize after probationary period. Eligible candidates can apply online on or before 01-11-2018. Applications are allowed through online only. Filled application printed copy along with the necessary documents should reach the UPPSC 21 days before after submission of application form online. 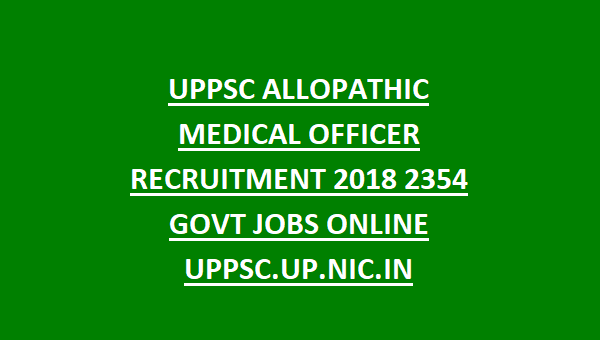 Please see the below given details for this UPPSC Allopathic Medical Officer Recruitment 2018. Follow us on twitter @govtjobonline…. There are total 2354 vacancies available in Uttar Pradesh Public Service Commission Provincial Medical and Health Service. MBBS qualification required from a recognized university of Medical Council of India. Preference will be given to the Post graduate candidates. The candidates have to undergo for a 2 years of probationary. Please Like our Page on Facebeook at www.facebook.com/govjobonline…. Lower age limit is 21 years and Upper age limit for general candidates are 40 years and for SC/ST/OBC candidates 5 years, Ex-Serviceman 8 years and for PH candidates 15 years of age relaxations are given. Selection for this UPPSC Allopathic Medical Officer recruitment will be held through personal interview only. If applications received more number then a screening test will be conducted. Preference will be given to the Experience candidates. For General/OBC candidates have to pay Rs.105/- and for Rs.85/- for SC/ST candidates Rs.65/-, For PH candidates Rs.25/. The candidates have to pay this amount through the respective bank chalana generated at the time of application online. The eligible candidates can apply online through the official website of www.uppsc.up.nic.in. Online mode of applications only acceptable for this UPPSC Allopathic Medical Officer Recruitment. Before filling application form online please read the official notification and user instruction carefully. The candidates has to send the filled application copy through the registered/speed post while mentioning on envelope "Application for Allopathic Medical Officer". Click here to apply online for the UTTAR PRADESH Public Service Commission Allopathic Medical Officer Recruitment 2018. 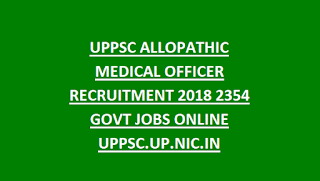 Click here to see the official notification of UPPSC Allopathic Medical Officer. Please share this UPPSC Allopathic Medical Officer Recruitment 2018 article to your lovable friends through social networking sites..